Masjid Mai as Sai Baba would call it is the place where Sai Baba spent most of his life. Darbar would be hold in the Masid Mai. Sai Baba performed many miracles. Miracles he performed out of love and care for his devotees whom he drew near him. Countless devotees benefited and still benefit from his great characteristics of performing miracles. However the greatest miracle I feel is the miracle of sowing the seeds of Bhakti or devotion in the devotees. The closeness the devotees feel with him. The motherly figure of Sai Baba, who’s presence is always felt by his devotees, whenever he is needed. The grace-showering saint, known as Sai Baba, always eager to wash his devotee’s troubles and problems, used miracles and uses miracles to calm down his devotees and unburden them. 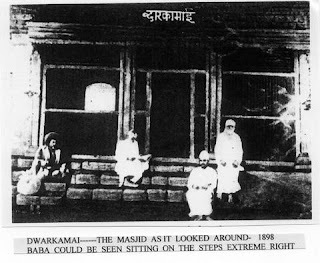 Sai Baba often used to say that those who climb the steps of Masjid Mai, the Dwarka Mai all their problems will be solved. He also often said that he is eager to take the burden of his devotees, if they surrender to him whole heatedly and cast their burden on him. 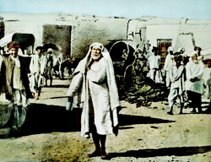 Sai Baba kept the fire alive in the Masjid Mai, which he called Dhuni. He said that the Dhuni was there to burn all the sins of His devotees. The Dhuni is still alive and burning the sins of the loved devotees of the great saint and unparalleled saint, called Sai Baba. 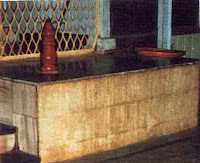 If we visit Shirdi now the Dhuni has been covered by the grill, and at the end of the grill there are two small Padukas installed, this is the place where Sai Baba used to sit, near the Dhuni and work for the devotees and humanity in general. 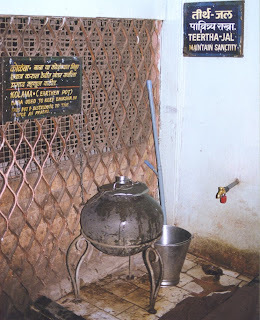 from where the devotees can drink the water as prasad. There is a Nimbar in the west facing Mecca. 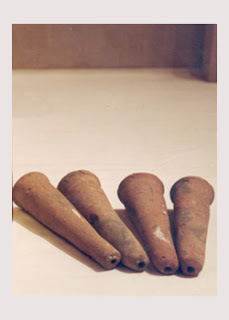 Lamps were lightened and kept there by Sai Baba and still we can see the lamps there. 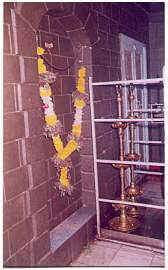 This is the place where Sai Baba used to sleep with his head pointing towards the Nimbar, with Mahlsapati and Tatya as described in Sri Sai SatCharitra. 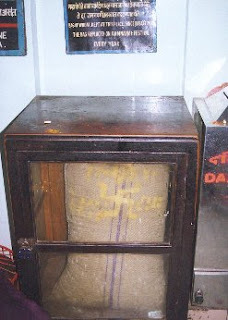 Wheat Bag placed in Dwarka Mai Of Sai Baba which is changed once in a year by Shirdi SaiBaba Sansthan. 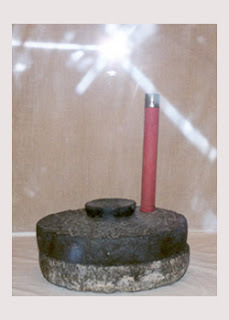 In the corner by the grinding stone there is a cupboard where Sai Baba used to put his clay pipes he used to smoke tobacco. 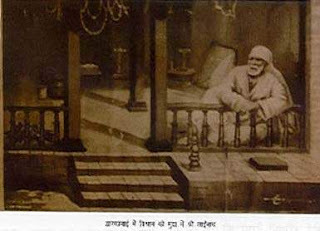 Portrait of Sai Baba by Jaykar on which Sai Baba commented " This Picture will live after me"
Baba used sit in front of Dhuni often with his arm kneeling on wooden rest. 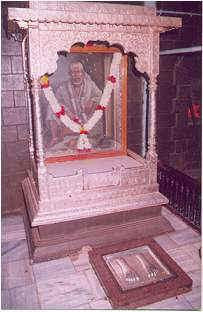 Here is placed a Painting of Sai Baba, which was painted by one devotee, named Jaikar. When this picture was brought to Sai Baba, he said “ This picture will live after me”. 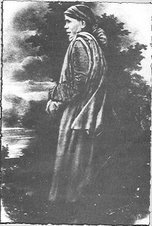 The original picture is now found in museum. Just in the corner after that is the bathing stone which Baba used. Sai Baba - I know you are with me, you have protected and comforted me through my bad times. But baba, I have prayed to you for so long and my wish still remains unfulfilled. You miraculously fulfil so many devotees' wishes, I keep questioning you why am I left out? I do have faith and therefore, with Shradha and Saburi, I await your call. Just that sometimes with time passing by, gets difficult to understand whether my wish will be true as you know baba, I have not asked for material items. I wait for my turn Baba, take care of my problem and answer me. Work a miracle Baba. Only a miracle from you will save me from this situation. I have nobody to turn to, and feel thrown off balance and left out. Help me baba. may sai baba bless us all..
baba give me a house. when i became your devotee. you gave every thing for me.including my son.only you can save my husband in this situation.please give him a job what he is waiting. only you can save him. I am very happy to get the darshan of Sai Baba. Sai baba help me. I pray to you from the bottom of my heart to help me in this situation. only you can help me at my work place and my personal life. i know you will help me, i trust in you and hope my prayers will be heard soon. 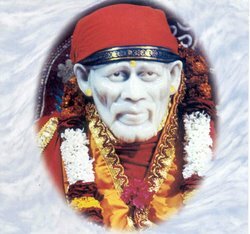 sai baba, please help me in this situation.. baba only you can help me, baba please keep your blessings with me.. 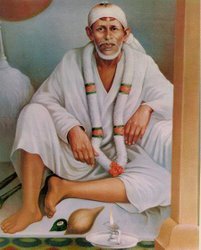 I need you baba, I need you a lot..
Sai Nath, I know you are helping me. Please give me confidence and patience. Please give me strength to face this situation and come out successfully. Please help my daughters and my husband. I totally surrender to you. I trust you. You are my Satguru. Thank you for everything. Baba, please help my baby, please Baba. to have on line darshan every day and it is upto HIM to shower HIS blessing on us when right time comes to us. It is not a commercial comodity to get on bargaining. Thank you for the website, i'm visiting here because i was dream of Masjid Mai (i'm muslim) from Kuala Lumpur, Malaysia. hey sai nath sab ki madad karo sab ke dukh dur kar do. hum sab aap hi ke bande hai om sai nath. Baba,u help me a lot where i there is no word to say but my son suffering from his sickness....only u can cure and make it happen in this world...i trust u baba...i know u will solve all my problems and i will be at Shirdi,give me a safe and peaceful journey...see u baba!!!!!!!!! sri sai samartha! thankyou for giving hope for a happy and peacefull life. thanks for listening to my mothers prayers. I have recently known Sai. He has blessed me with lots of blessings and. I am sincerly needing 2 of my wishes to be fulfilled. Sai samaratha please pray for me. om sai ram . 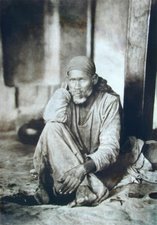 sai baba humbacho ko hmesha apne charno ke pass rkhna aur hum par apni kripa drishti bnaye rkhna sai nath apke siwa hum bacho ka koi nae hai sai baba hum par dya krna. 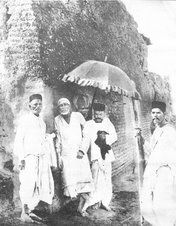 Anant koti brahmaand nayak raja dhi raaj yogiraaj sachidanand satguru sri sai nath maharaj ki jai . Dear Baba im undergoing full of confusions in my life please save me from all the evil and bad times and show me the right path. In my career in just going on shifting from one place to another but i want to settle in one office and grow there in my career. I should look after my mother, my son, my brother and my husband. Please baba help me and let my brother alone come back home living all his bad companions. My mother is becoming mentally weak day by day thinking of my brother. Its alomost 3 months that y brother has left our home. We want him back let us all lead a happy life. My husband has got problem in his business. Please help him and remove all his tensions and give him peace of mind and patience at his work place. Give my son good health and good thoughts to my son. Give him good education in his life. Help and save our family baba. 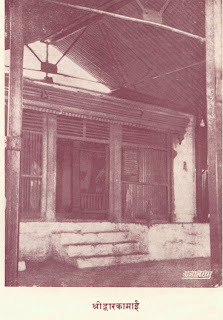 Om Sai Shri Sai Jaya Jaya Sai. Jai Sai Ram. Dear Baba iam very much happy to see you shiridi. My first visit in my life to shiridi is a memorable event. We always want you in my life in each and every step of our life. Please make our Baba Bhajan a successful event. Everyone should like it and encourage us for more and more bhajans. I met you and spoke to you in shiridi and iam very happy about it. Baba please bless us that we all should visit shiridi once in a year. Also please bless my sister with baby. Please baba bless all our family members and our well wishers. JAI SAIRAM. Om Sai Ram, Baba thank you for helping me through tough times. Baba, I am embarking on a new journey tomorrow. Please bless me and all in my family and show a sign, Baba to guide me through these times. Jai Sai Ram. Mujhe raha dikhayiye. baba ki tabiyat thik kar dijiye aur badi arthik madat bhi chahiye. aapke siva aur kise ke samne haat phailane ki jaroorat nahi aane digiye. Jai sai ram. 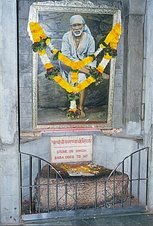 Sai Nath ki Jai. 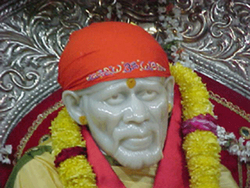 Shree Sai Nathaye Namaha. Dwarkamai ki jai. U favoured me so much even without asking you for it. However, now ask you to favour me a place at your feet and oblige. jai Sai Aai. Baba you help me a lot for all the situation.Baba right now I am in deep trouble.Baba please take me out from this trouble. Baba please help me. You are my mother. I do not know I sometimes act like a mad person. Please god help me. Tu hi hai baba jisko mein janati hun and beleive karti hun. Baba please help baba. maine aapko kabhi nahi dekha sai.par jab main..apke mandir main job ke liye duaa ki thi.to aagle hi din mujhe naukri mil gayi thi bo bhi HCL main.main nahi janta ki ye aapne kiya ..par itna jaror kahunga ki maine aapki sahran main aakar kuch mahsus kiya tha jo main wayqat nahi kar sakta par mahsus kar sakta huin. aapki hi kripa hai ki mujhe mera dost jisne kabhi mujh se baat na karne ki baat kahi thi...bo bhi mere pass agle hi din mujhe mil gaya tha. aap jante hain ki main kis ki baat kar raha huin. main aap se yahi kahna chahata huin ki mujh par apni kripa sada sarvda banye rakhe sainath. Thank you Baba for helping me out of the dreaded situation! Please accept my humble salutations. 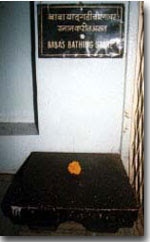 Jai Shri Sai nathaya Namaha. Shri Samarth Satchidananda Sadguru Sainath Maharaj Ki Jai! love u lot SAI RAM .Sai Ram always help us.& always with us. Mujhe maaf kar do. jane ya anjane main maine jo kuchh bhi kiya tha. aap to sab jante prabhu. aap ki bachi hu app ke bache to aap ki saja aur pyar dono ke hakdar hai.aap jesa chaho baba ya saja do ya pyar apni bachi ko. jai sai baba ki. aap ki bachi sunita. Om Sai, Sri Sai, Jai Sai. Only you have helped me get my lost job back at the same company I worked for in 2009 and I have gotten a much better position there than before and you have fixed my personal life and brought harmony and happiness and peace. Thanks Dearest Sai. Jai Sai Baba. Baba meri ya to ek bahul acchhi naukri lagva do ya mera business jo main shuru karna ja raha hoon, use bahut acchhe se chalva do. Main aapke darshan ke liye Shirdi aa raha hoon. alpesh ji,ap sai bhakto ke lie bhut acha kam ker rahe ho.sabh baba ki cheeje anandmai he.in ko dekh ker to ase lagta he ki baba ke pass bethe he.aap ki website saibhkto ke lie verdaan he. Sai baba you have been with me in moments of truth and never left me alone. I lkove you and have full faith in you. My wife and I long for a child. Please fulfil this wish of mine.With God everything is possible. Sri Shirdi Sai Baba has been my strength leading, guiding me through, from very difficult moments of my life. OM SAMARTHA SATGURU SAINATH MAHARAJ KI JAI. jai sai ram, jai ho mere mail...... mere sai. Baba,I am paying gratitude from core of my heart for giving me new life.It's impossible to ink my happiness and feelings for you.Thank you so much for everything. My Lord Sai Baba, it takes so long to understand what SABURI really means.
" OM SAI SRI SAI JAI JAI SAI "
Honestly, Of late, I was pulled /dragged towards you for no reason and am transforming to a faithful and mad devotee of yours. In a meanwhile, very recently, I am physically unwell and have lost my peace of mind. Doctors have said that nothing is wrong with me. Only you will be knowing my problem/ illness. I believe that you have instructed me and pulled me towards yourself only to heal me from this suffering. I have now surrendered myself to you and beg you to save my life and relief from my illness. Please forgive me for any of the sins committed by me, if any, intentionally or unintentionally. I need your blessing to be with you always. I am sure you will bless me & my family with healthy mind & body /life - as you do to all your devotees. Baba... 1st time i am writing something here. Please give me strength to write then only i will feel relax. Baba i luv u.. and u know about my problems.. baba help me to surrender all my bad habits in front of you. Only then i can worship with full heartedly . I know i am imperfect and immature but only ur bhakti give me all what i want. please help me and take all my bad habits. I want only 1 thing in my life i.e. Sai. Om Sai Ram!! Baba, you know my sorrow, grief that i am suffering through. I need your blessings baba, please accept my prayer and show me the right direction.